They should be going to war over it. It's an incredibly important achievement for them, and if Democrats cannot defend a deficit-reducing bill that brings health care insurance to 32 million people and allows folks with pre-existing conditions to get any insurance they want, if they can't defend that, frankly, they, on some level, don't really deserve to be a party. If you can't defend the best thing you've done in a generation, then you've got some political problems that are bigger than anything the Republicans are doing to you. The Washington Post writer eventually predicted that Republicans would be embracing and defending Obamacare by the year 2050. Klein: "In 2050 Republicans will be saying, 'How dare you cut Obamacare?'" KEITH OLBERMANN: As mentioned, House Republicans voted preliminarily today on repealing health care reform. The motion to advance debate passed, with the actual repeal vote scheduled for next week. The push comes despite the Congressional Budget Office's determination that repeal would increase the deficit by $230 billion over 10 years, but, damn it, the GOP has a catch phrase and they are going to repeat it into the ground. OLBERMANN: But a Harvard economist says repeal would actually kill jobs. He estimates it would cost from 250,000 jobs to more than 400,000. That's per year for the next 10 years, adding that, in the nine months since the President signed health care reform into law, 200,000 new jobs have been created in just the health care industry. Tangential evidence of that, the L.A. Times reports that more small businesses are offering health care to employees because of the tax credit in the new law that encourages them to do just that. One example, Blue Cross/Blue Shield of Kansas City reporting a 58 percent increase in the number of small businesses purchasing coverage since April, one month after the reform tax credit went into law. Let's turn now to Washington Post staff writer, and Newsweek columnist, and MSNBC contributor Ezra Klein. Good evening, Ezra. EZRA KLEIN, WASHINGTON POST: Good evening, Keith. OLBERMANN: I think I, even I get the implication of a spike in sales of insurance programs to small businesses, but explain it anyway. KLEIN: A spike in sales of insurance to small businesses during a horrible economy in which they're going out of business, that's pretty much unprecedented, and what it means is the small business tax credit that is going out across the country, what we're seeing is much larger take-up than we anticipated. And they're taking it up because it's finally made it affordable for them to offer insurance for their employees. That L.A. Times article, if you can get your hands on it, is actually a pretty powerful document because you have these business owners in there who were clearly agonizing for years that they couldn't do this for their people. They said, "It came, finally, it came, and it's been perfect." And it's got a restaurant owner in there, and she says, "Every chef who works for me, we now, we're able to get them health care, and it's been wonderful." It's mattered. OLBERMANN: And it's not, the knee-jerk response to opponents of health care reform would say, well, that's part of the mandate, right? Well, the mandate doesn't kick in for years yet, doesn't have anything to do with you have to do this. They chose to do this. KLEIN: No, the mandate is not operative here at all. OLBERMANN: All right. Is this exactly what happens when even a flawed minimal health care reform law like the one that passed last year has gotten into effect? Nine months, and the benefits start to become quantifiable? KLEIN: Absolutely. These benefits are trickling in. This is one of the first major ones that's really come in, but now repeal is going to mean taking this credit from every one of these small businesses, and these chefs are going to become uninsured once again. And this is going to be the difficulty for the Republicans going forward. The CBO came out this week, and, as you mentioned in your introduction there, they said, you know what, you guys are going to cost us $230 billion if you do this. And, by the way, you're also going to mean 32 million people don't get insurance in the next 10 years. The good thing for the Republicans is, most of those people don't have insurance yet. If they did, there'd be no way to do this at all. But the thing that Democrats learned when they tried to pass health care reform is that things are popular in general and they get unpopular when you get specific. And Republicans are about to find out the same thing. They want to repeal it all? Well, they're repealing all the popular parts, too, and we've polled that a lot. When you try to repeal the popular parts of health care and ask the American people about it, they don't like that one bit. OLBERMANN: Speaker Boehner already dismissed the CBO as "their opinion." Should Democrats thus not only because of the results of the sort of anecdotal evidence out of the insurance industry, but should, because of Boehner's attitude towards this and your point about specifics versus the general, should the Democrats relish rejoining this fight over health care reform on that specific level? KLEIN: They should be going to war over it. It's an incredibly important achievement for them, and if Democrats cannot defend a deficit-reducing bill that brings health care insurance to 32 million people and allows folks with pre-existing conditions to get any insurance they want, if they can't defend that, frankly, they, on some level, don't really deserve to be a party. If you can't defend the best thing you've done in a generation, then you've got some political problems that are bigger than anything the Republicans are doing to you. OLBERMANN: And yet, we know Republicans have been monumentally successful at controlling the narrative on how health care reform was perceived for two years, for two uninterrupted years. If the Democrats lost policy as politics the first time around, how do they avoid it this time around besides sort of a common sense approach that you already suggested? KLEIN: There's good political science showing that people don't like things Congress does. There's a tendency, we in the media report on conflict. We spend all our time talking about the parts of things that people don't like. There are a lot of reasons while something is happening for folks not to like it. The thing is, when you have good policy and good policy goes into effect like these small business tax credits, that's when people do begin to like it. That's why Medicare is untouchable even among Republicans, why they keep going to the floor and saying how dare you cut this socialized government health care plan or same with Social Security, of course. So what Democrats really need to do is protect this thing for long enough that people can begin to benefit from it. And Republicans know full well that if they get it that far along, they've got no choice of getting this off the books anytime soon. OLBERMANN: Get your hands off my federally mandated tax cut and tax benefit and rebate for small business. It's too long of a catch phrase, but you get the idea. KLEIN: In 2050 Republicans will be saying, "How dare you cut Obamacare?" OLBERMANN: There will be a statue to you if that's correct. 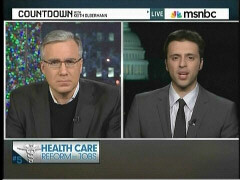 Ezra Klein of the Washington Post, great thanks and have a good weekend.